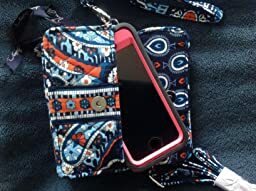 This is a nice little crossbody that can be used as a purse or as a wallet but may not hold your smartphone as described. 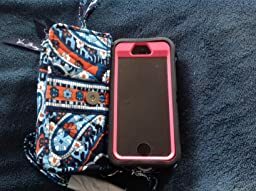 I have an iPhone 5s with an Otter Box case and I could just barely squeeze it into the phone pocket (and then the magnetic clasp won’t close). I can make it fit, but it’s just not practical to try and wedge it in and out of the bag all the time, particularly if the phone is ringing. If you have a smaller phone or smaller case this may be perfect for you, but it’s just a tad too small for my needs. Certainly larger phones such as the new iPhone 6+ and Gallaxy phones just aren’t going to fit regardess of the case. If you have a smaller phone or that feature isn’t important to you then this bag may be great for your needs. 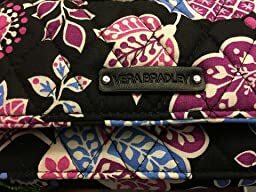 Vera Bradley products are much loved in our house. My daughters both enjoy having a small purse and this really works! It has all the compartments she asked for and a place for her phone! Can be used as both a wristlet or a crossbody! I love the bold and vibrant colors! It really makes a statement! 5 star quality – great price point and perfect for gift giving! This wallet is exactly what I was looking for. 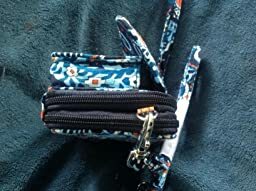 I wanted a wallet to put in my pursebon days I would carry a large purse, but then I could carry on its own for the dog park and the gym when a purse was impractical but I still needed to carry my driver’s license and phone. This fits the bill perfectly. There are two zippered compartments and a front pocket that snaps closed. I use the front pocket for my phone. My Samsung Galaxy S4 fits, but barely. If you have a larger cell phone, this isn’t going to work for you. One zippered compartment nis for your driver’s license and credit cards. I like the fact that it zips closed for.security. The second zippered compartment had a zippered change compartment in it. My keys fit in here. I like that it can be worn as a wristlet, a cross body, or a waist pouch.